نيوزيلاندا(New Zealand) دى دوله فى جنوب غرب المحيط الباسيفيكى و العاصمه بتاعتها هى ويلينجتون و اكبر مدينه فيها هيا اوكلاند. اكتشفوا نيوزيلاندا يوم 13 ديسمبر 1642  فى فترة قريبة من اكتشاف استراليا اكتشفها ابيل تسمان الرحاله الهولندى فى رحلته سنة 1641م و بعد كده جه المكتشف الانجليزى جيمس كوك و اكد الاكتشاف ده. بعد كده بميت سنه استعمرها البريطانيين. نيوزيلاندا استقلت عن حكم المملكة المتحدة فى 26 سبتمبر 1907. نيوزيلاندا دولة جزيرة فى جنوب غرب المحيط الهادى و بتضم جزيرتين كبار بيكونو معظم مساحتها هما ( الجزيرة الشمالية و الجزيرة الجنوبية ) و بتضم جزر صغيره كتيره . و اراضيها على بعد 1500 كلم (900 ميل) شرق اوستراليا بيفصلهم بحر تسمان ، و على بعد حوالي 1000 كلم (600 ميل) جنوب دول جزر المحيط الهادى كاليدونيا الجديدة ، فيچى ، و تونجا. ↑ "New Zealand's National Anthems". Ministry for Culture and Heritage. Retrieved 17 February 2008. ↑ "Protocol for using New Zealand's National Anthems". Ministry for Culture and Heritage. Retrieved 17 February 2008. ↑ "The New Zealand Land Cover Database". New Zealand Land Cover Database 2. New Zealand Ministry for the Environment. 1 July 2009. Retrieved 26 April 2011. ↑ "National Population Estimates: December 2010 quarter". Statistics New Zealand. 14 February 2010. Retrieved 19 February 2011. ↑ "QuickStats About New Zealand's Population and Dwellings: Population counts". 2006 Census. Statistics New Zealand. Retrieved 14 April 2011. ↑ أ ب ت ث "New Zealand". International Monetary Fund. Retrieved 14 April 2011. ↑ "Equality and inequality: Gini index". Human Development Report 2009. United Nations Development Programme. Retrieved 14 April 2011. ↑ "International Human Development Indicators – New Zealand". United Nations. 2010. Retrieved 28 February 2011. ↑ "God Save the Queen" is officially a national anthem but is generally used only on regal and vice-regal occasions. ↑ Percentages add to more than 100% because some people speak more than one language. They exclude unusable responses and those who spoke no language (e.g. too young to talk). ↑ Percentages add to more than 100% because some people identify with more than one ethnic group. ↑ There is a multitude of dates that could be considered to mark independence (see Independence of New Zealand). ↑ The proportion of New Zealand's area (excluding estuaries) covered by rivers, lakes and ponds, based on figures from the New Zealand Land Cover Database, is (357526 + 81936) / (26821559 – 92499–26033 – 19216) = 1.6%. If estuarine open water, mangroves, and herbaceous saline vegetation are included, the figure is 2.2%. 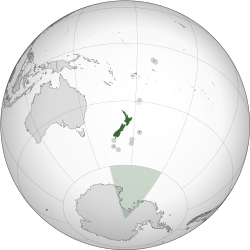 ↑ The Chatham Islands have a separate time zone, 45 minutes ahead of the rest of New Zealand. ↑ The territories of Niue, the Cook Islands and Tokelau have their own cctlds, .nu, .ck and .tk respectively. الصفحه دى اتعدلت اخر مره فى 27 اكتوبر 2017,‏ 04:33.